SIHH is a place where the world of watches comes together and the new trends and collections for the year ahead are revealed, putting a spotlight on the latest creations in watchmaking. As the 2019 exhibition came to a close we left delighted that four of our top brands had really ‘wow-ed’ us with their latest innovations! Cartier was one of the original brands that opened SIHH in 1991 and they are not a brand that are afraid to look back and revisit their history. Originally designed in 1904, last year they reinvented the Santos collection and it became more ergonomic-friendly and wearable, as they curved the lugs and rounded the case. They also introduced the QuickSwitch system so that it can be easily changed between a strap and a bracelet. This year instead of a new collection, Cartier decided to add to the existing iconic Santos collection with the Santos Chronograph. The charming thing about this model is that instead of the traditional start/stop/reset pushers on the right-hand side, Cartier brings the aesthetics to the forefront, aligning the left-hand side pusher to the crown for a perfectly balanced look. 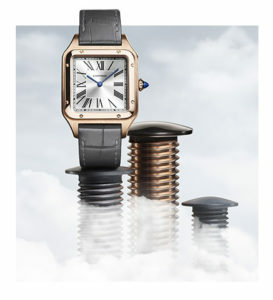 In a “same-but-different” feel, Cartier introduced the Santos-Dumont, which has the classic rounded square-shaped case, but it is neater and thinner. In some ways, the case resembles that of the Panthere de Cartier, but with a more masculine style thanks to the brushed metal case. Available only on leather straps, this model is a new addition to Cartier’s entry level watches. 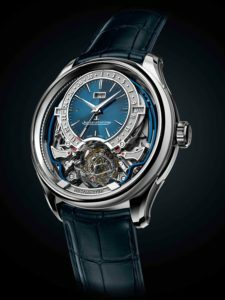 Jaeger-LeCoultre perfectly showcased their dedication to the ‘Art of Precision’ at SIHH and dropped numerous new innovations – a trio of Master Ultra-Thins, Rendez-Vous Moon and the Master Grande Tradition Gyrotourbillon Westminster Perpétuel. The trio of Master Ultra-Thins from Jaeger-LeCoultre perfectly demonstrates their excellence in the craft of enamelling – which is rarely seen today. Distinguishing the trio is the movement and complications that are held within the 18ct white gold case. There was the Tourbillon, Perpetual and Moon – each is extremely limited and less than 100 have been produced! 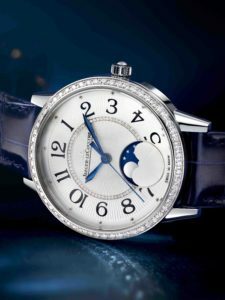 Jaeger-LeCoultre modified the existing calibre in the Rendez-Vous and reinvented the moon phase feature with the addition of clouds. Their exceptional craftsmanship is made clear in the detail, with the combination of sparkling diamonds, mother of pearl dial and the moon phase creating a romantic sky within the fine timepiece. Master Grande Tradition Gyrotourbillon Westminster Perpétuel – a very complex piece of watchmaking art. It is the fifth generation of the Gyrotourbillon from Jaeger-LeCoultre and the brand presented the first multi-axis tourbillon with a constant-force mechanism, Westminster chime and perpetual calendar. 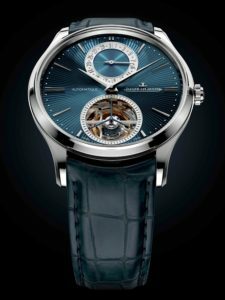 They also demonstrated their level of craftsmanship by reducing the size of the tourbillon, making it more wearable. At SIHH IWC paid tribute to the Silver Spitfire with their aviation inspired booth, setting the tone for their new releases. They introduced four new timepieces into their Pilot’s watch collection – Pilot’s Watch Timezoner Spitfire Edition “The Longest Flight”, Pilot’s Watch Chronograph Spitfire, Big Pilot’s Watch Constant-Force Tourbillon Edition “Le Petit Prince” and Pilot’s Watch Double Chronograph Top Gun Ceratanium. 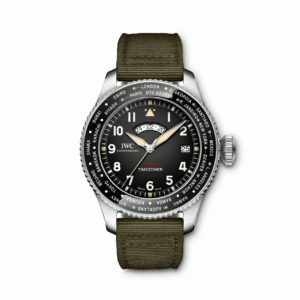 First up is the Pilot’s Watch Timezoner Spitfire Edition “The Longest Flight” which is dedicated to pilots Steve Boultbee Brooks and Matt Jones and pays homage to their trip around the world in a Spitfire. At the heart of the model is a calibre which, for the first time, combines the patented Timezoner mechanism with an automatic movement. The exterior is then designed to imitate the cockpit of a Spitfire. 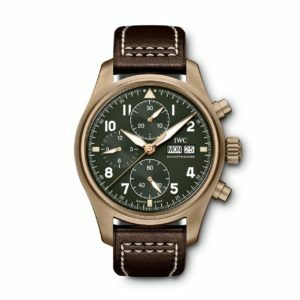 Watch lovers always enjoy seeing timepieces in alternate materials and IWC met this need with the Pilot’s Watch Chronograph Spitfire. This beautifully designed watch has a completely unique aesthetic and is equipped with a bronze case, olive green dial and brown leather strap. Over time and with skin contact the bronze case will develop a patina effect, making every piece truly individual to you. Whilst retaining the efficiency of the IWC manufactured calibre they’ve also managed to shrink the size of the movement and it comes in at a neat 41mm. The Big Pilot’s Watch Constant-Force Tourbillon Edition “Le Petit Prince” again shows an alternate metal case. While it looks like a normal red gold case, IWC named it as “hard gold”. In the manufacturing process of this alloy, they have modified it in a special way that allows the red gold to be 5-10 times harder and stronger than regular gold. 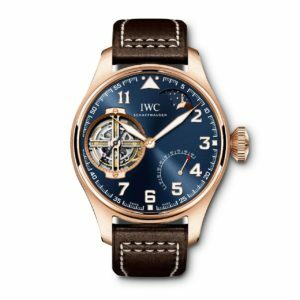 This is also the first time a constant-force tourbillon has been used in IWC’s Pilots watch range. 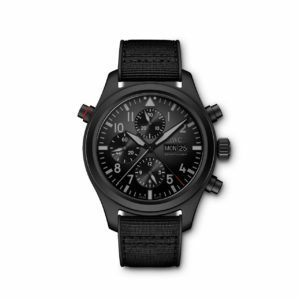 Adding to the Top Gun range, which is supplied to elite fighter pilots in the U.S. Navy, the Pilot’s Watch Double Chronograph Top Gun Ceratanium is extremely robust and will withstand the harshest environments. For the first time, IWC also utilises a new innovative material, Ceratanium, to craft a case that is corrosion-free. The new material delivers a cool matte black look, but more importantly it combines the scratch-resistance of ceramic with the strength and weight of titanium. 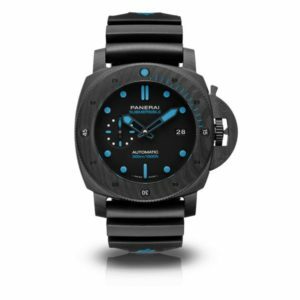 This year at SIHH, Panerai devoted their product presentation to their Submersible (dive watch) range. Their array of watches included seven new models in three limited edition collections, inspired by their partnerships with inspirational people, such as, Guillaume Nery and Mike Horn. Panerai makes use of alternate materials such as Cabotech and BMG-Tech and the introduction of reduced size timepieces at 42mm also made an impact. Aligning with the Submersible DNA, Panerai launched their partnership with Luna Rossa, the Italian Sailboat Racing Syndicate and Challenger of Record to the 36th America’s Cup. To support their partnership, Panerai introduced the Submersible Luna Rossa which features a grey sailcloth dial obtained from actual Luna Rossa sails, as well as a GMT function. The new Submersible will be worn by the Luna Rossa Sailing Team throughout their adventures. 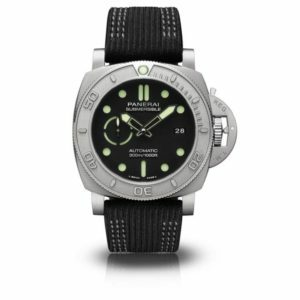 Panerai also created a watch for their ambassador Mike Horn, explorer of extremes. As Mike Horn continues to push boundaries so does Panerai, crafting the case using EcoTitanium (recycled titanium) which they created in their own laboratory, using only recycled plastic to make the strap. This ground-breaking change demonstrated the brands environmental awareness and perfectly showcases their commitment to eco-preservation. Extending the Submersible range was the Submersible Carbotech and Sumbersible BMG-TECH – these are classic, high performance diving watches that use alternative materials. Created by Panerai, Carbotech was introduced in 2015 and is made of carbon fibre materials. 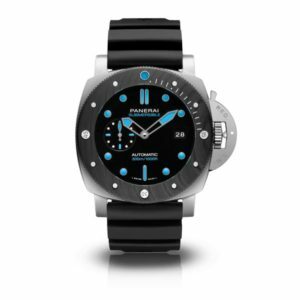 Perfect for diving watches, it is even more lightweight than titanium and stainless steel. The Submersible BMG-TECH, in simple terms, is an alloy of high strength and corrosion resistance. While the case and crown protector are made from this special alloy, the bezel makes use of Carbotech’s high-performance properties, as well as providing a cool and modern look. Lastly we have the Panerai 42mm which is a basic, no-fuss model. 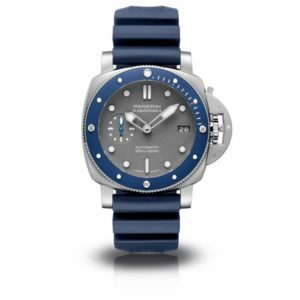 The case is crafted from classic stainless steel and is displayed on a rubber strap – a diver’s favourite. Even as the most “basic” model of the range, the instrument is still equipped with a date function, small seconds sub-dial, and an automatic movement with 72 hours power reserve! At a more wearable size of 42mm, this model is definitely one to watch out for. Thank you for taking the time to read our review of SIHH 2019! Follow our latest news on Twitter, Facebook, Instagram, YouTube and Pinterest, or if you have any questions please pop us an email at info@laingsuk.com.